This article is about a building in central London. For similarly named buildings, see Central Hall (disambiguation). The Methodist Central Hall (also known as Central Hall Westminster) is a multi-purpose venue and tourist attraction in the City of Westminster, London. It serves primarily as a Methodist church and a conference centre, but also as an art gallery and an office building (formerly as the headquarters of the Methodist Church of Great Britain until 2000). It contains twenty-two conference, meetings and seminar rooms, the largest being the Great Hall, which seats 2300. Methodist Central Hall was erected by Wesleyan Methodists to mark the centenary of John Wesley's death in 1791. [dubious – discuss] It was built in 1905–1911 on the site of the Royal Aquarium, Music Hall and Imperial Theatre, an entertainment complex that operated with varying success from 1876 to 1903. Meetings of the suffragette movement took place at Methodist Central Hall in 1914. Scenes were re-enacted in the 2015 film Suffragette, some of which was shot in the hall. Methodist Central Hall hosted the first meeting of the United Nations General Assembly in 1946. In return for the use of the hall, the Assembly voted to fund the repainting of the walls of the church in a light blue. While it was being used by the UN General Assembly, the congregation relocated to the Coliseum Theatre. It has been regularly used for political rallies—famous speakers have included Mohandas Gandhi, Martin Luther King and Winston Churchill. In September 1972 the Conservative Monday Club held a much publicised "Halt Immigration Now!" public meeting in the main hall, addressed by several prominent speakers including members of parliament Ronald Bell, John Biggs-Davison, Harold Soref, and John Stokes. The Monday Club continued their use of the building until 1991 when they held two Seminars there. The FIFA World Cup trophy was on display at Central Hall in early 1966 in preparation for the football tournament being held in England that summer. It was stolen from the hall on 20 March 1966 and was recovered seven days later in South London, but the thief was never caught. England won the trophy four months later. In 2005 Central Hall controversially applied for a licence to sell alcohol in its café and conference venues. As the Methodist Church has traditionally promoted abstinence and usually forbids consumption of alcohol on church premises, many Methodists argued that the application was in defiance of church rules and a written objection was compiled. The grand organ contains 4,731 pipes and is located in the Great Hall. The Methodist Central Hall is a Grade II* listed building. It was designed by Edwin Alfred Rickards, of the firm Lanchester, Stewart and Rickards. This company also designed the City Hall building in Cathays Park, Cardiff, with which it shares many similarities. Although clad in an elaborate baroque style, to contrast with Westminster Abbey, it is an early example of the use of a reinforced concrete frame for a building in Britain. The interior was similarly planned on a Piranesian scale, although the execution was rather more economical. The original 1904 design included two small towers on the main (east) façade, facing Westminster Abbey. These were never built, supposedly because of an outcry that they would reduce the dominance of Nicholas Hawksmoor's west towers at Westminster Abbey in views from St James's Park. The hall was eventually finished in 1911. Couplers: III-I, IV-I, I-II, III-II, IV-II, IV-III, Sub and Super III, Sub and Super III, Unison off III, Unison off IV, I-P, II-P, III-P, IV-P.
8 General Combinations, 8 Divisional Combinations for each Manual and the Pedal (on 256 Memory Levels); Continental Stepper (General Piston Sequencer + and -). ^ a b c Janello, Amy; Jones, Brennon (1996). A Global Affair: An Inside Look at the United Nations. I.B.Tauris. p. 20. ISBN 1860641393. Retrieved 19 October 2012. ^ "Organiser". Central Hall Westminster. Retrieved 19 October 2012. ^ a b c Wittich, John (1988). Churches, Cathedrals and Chapels. Gracewing Publishing. p. 102. ISBN 085244141X. Retrieved 19 October 2012. ^ a b c d "Background to the building". Central Hall Westminster. Retrieved 19 October 2012. ^ "#Votes100 - Suffragette Movement and Methodist Central Hall - Methodist Central Hall, Westminster". Methodist Central Hall, Westminster. 5 February 2018. Retrieved 12 February 2018. ^ "United Nations Day 2016 - #UN71 - Methodist Central Hall, Westminster". Methodist Central Hall, Westminster. 24 October 2016. Retrieved 12 February 2018. ^ Monday News, Oct.1972 (Monday Club publication). ^ Monday Club News, January 1992. ^ "Methodist Central Hall Westminster, Songs of Praise - BBC One". BBC. Retrieved 12 February 2018. ^ "1966: Football's World Cup stolen". BBC. Retrieved 19 October 2012. ^ Eunice K. Y. Or (23 May 2005). "Methodist HQ Alcohol License Application Sparks Abstinence Debate". Christianity Today. Retrieved 19 October 2012. ^ Historic England. "Methodist Central Hall, Westminster (1264457)". National Heritage List for England. Retrieved 10 January 2019. ^ Rob Humphreys (2010). 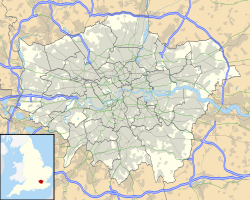 The Rough Guide to London. Rough Guides UK. ISBN 1405384778. Retrieved 20 October 2012. ^ "Historic Weddings Venue Central Hall Westminster London UK". Central Hall Westminster London UK. Retrieved 14 February 2017. ^ Great Organ at Westminster Central Hall . www.harrisonorgans.com. Retrieved May 9, 2018. 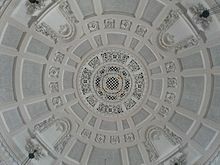 Wikimedia Commons has media related to Methodist Central Hall, London. This page was last edited on 17 March 2019, at 08:34 (UTC).